Well, no more. 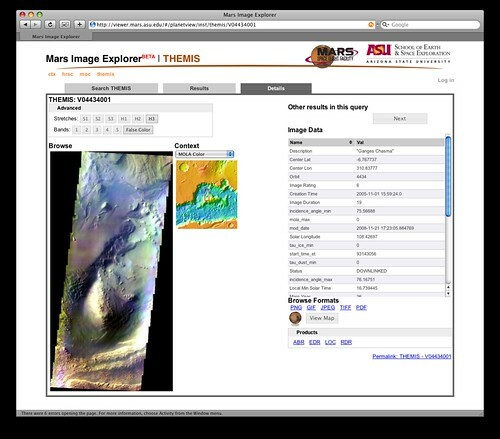 Though it's not officially released, I'm putting my latest work out there - a unified Mars Image Explorer that'll eventually replace a half dozen or more different kludgy sites with a single easy-to-use interface for images from a variety of instruments orbiting Mars. Drupal powers the page generation, user management and access control, jQuery runs the AJAX interface, Python/web.py manipulates images in real time efficiently, and Java servlets deliver instrument data. So there. I actually have been doing something.